This week I am so thrilled to have friends joining me for Ice Cream Tuesday! Kirsten of Comfortably Domestic and some of her buddies were talking about putting homemade mallows in ice cream, and she messaged me to get my 2 cents, and one thing led to another. Now, we’ve banded together, along with a few other friends, to bring you an incredible array of tasty ice creams all containing either marshmallows or marshmallow cream, homemade or store-bought. Very exciting! Let’s get on with it, shall we? You may have read in my Throwback Thursday post last week that I got some lovely strawberries from our neighbor Gabriel. I used some of them in my retro “Jello” dessert and saved the rest for ice cream. For this week’s Ice Cream Tuesday, I knew we were Mallowing, and I had already sort of decided on making a key lime mallow swirl to put into…something. Then, when the strawberries arrived, the rest fell into place. Rather than swirling strawberry puree into a churned cheesecake base, I decided to blend it in, because who doesn’t like pink ice cream? 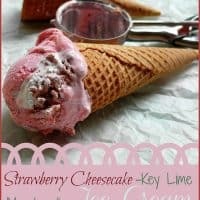 So, to a mellow strawberry cheesecake base, I swirled in tart key lime marshmallow cream. And because a)I cannot leave well-enough alone and b)I had some, I baked up some graham cracker crumbs in browned butter to add to the mix. 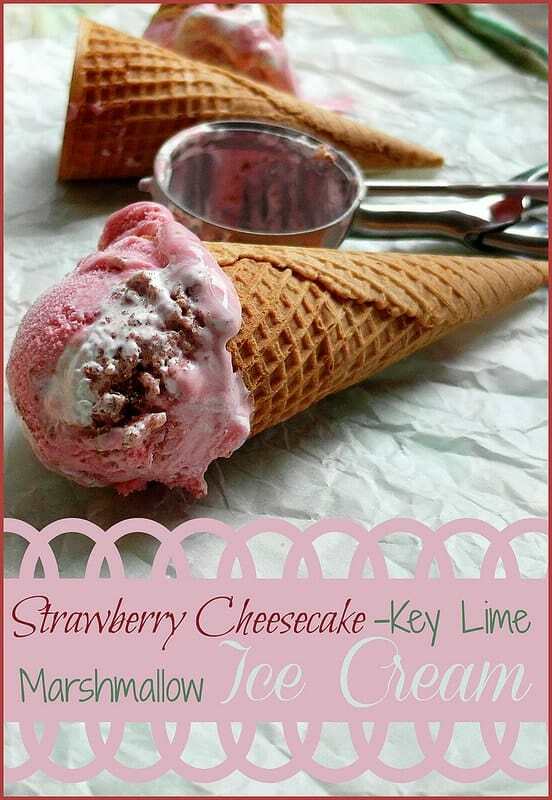 The resulting ice cream reads as key lime with strawberry sauce when you get a big mouthful of the mallow. Otherwise, it reads as summer strawberry cheesecake. It’s almost like having two ice creams in one, which is never a bad thing, especially since they go so well together. I took the strawberry cheesecake key lime marshmallow ice cream (wow, that is a mouthful, literally and figuratively) over to neighbor Chuck’s for his birthday celebration. Not everyone had some, because apparently beer and ice cream don’t go together. Whatever. Anyway, the folks who did try it, birthday boy Chuck included, thought it was great. And The Beloved thought it was great. And I think it’s great. I hope you will too. The base is incredibly creamy and rich and is scoopable straight from the freezer. The mallow cream, which is pretty much nothing more than a very stiff Italian meringue, stays soft at freezer temperatures as well, so there is no waiting around for the ice cream to temper. Just grab it out of the freezer and scoop away. I sort of invented the ice cream base and the graham cracker crumbs myself, and by that I mean that I didn’t consult any other sites or cookbooks. I just made them. The mallow cream is based on this recipe from Chow.com. The measurements are theirs. All I did was to substitute key lime juice for the water in the sugar syrup as well as for the vanilla and cream of tartar in the meringue mixture. And I doubled the salt. The resulting cream is fantastic. It is dense yet airy, if that’s a thing. It is almost juicy with key lime flavor. In fact, it would make an amazing topping for key lime pie. Enough with the description. Let me show you how I made it. The marshmallow ingredients are listed by volume because that is the way the Chow recipe was written. I did use a small amount of food coloring in both the base and the marshmallow. It is totally optional/completely unnecessary. Had I not used it, the ice cream base would have been much less pink, and I really wanted it to be a nice strawberry pink when churned. I just put a bit of gel coloring into the base using a toothpick. It probably amounted to one or maybe two drops of liquid food coloring. I used about the same amount of green coloring in the mallow. As you can see from the photographs, the mallow doesn't really read as green, but there is enough of a tint to keep it from being stark white. Put all the ingredients in a sauce pan over medium heat. Bring the berries to a boil, pressing down on them to break them down as they soften. Let simmer over low heat for 10 minutes until the juices look a bit syrupy. Chill in the refrigerator until you need it. Place the block of cream cheese in the jar of your blender. Place the half and half, 1 cup of sugar, yolks, corn starch and salt in a large sauce pan. Heat over medium heat, whisking constantly, until the mixture comes to a boil. Let boil for 10 seconds, still whisking constantly. Strain into the blender. Let sit for a couple of minutes to let the cream cheese get good and soft. Puree on high until completely smooth. Add the chilled strawberry puree and blend again until well combined. Taste and add the additional sugar if you think it needs it. You want the base to be just a smidge sweeter than you think it should be since the sweetness will be dulled in the freezer. Blend it in well until it dissolves completely in the warm base. Strain into a metal bowl set in an ice bath and chill to at least 40F. Pulse the crackers in the food processor until you have coarse crumbs. You can also put them in a zip top bag and smash them. That's what I did. Add the salt and sugar to the crumbs and stir around to distribute evenly. Drizzle in the melted butter, stirring well to make sure all the crumbs are coated. Dump the crumbs out on a Silpat-lined baking sheet and press/pat into a disc about 1/4" thick. It won't bake back together into one big cookie, so don't expect it to. Doing it this way makes sure everything browns evenly in the oven. Bake at 350F for 10 minutes. Remove and spread out the crumbs to cool completely. Place them in the freezer about 30 minutes before you need them. Put the sugar, corn syrup, 1/4 cup of key lime juice and salt in a small sauce pan. Put the egg whites, food coloring (if using) and 2 teaspoons of key lime juice in the bowl of your stand mixer fitted with the whisk attachment. Bring the sugar mixture to a boil over medium heat. Stir until it reaches a boil, then put the lid on it and let boil for 2 minutes to wash down any sugar crystals. With the high proportion of corn syrup, crystallization isn't a huge issue, but better to be safe than sorry. While the syrup is boiling with the lid on, start the mixer. Whip on medium speed until foamy. At this point, take the lid off the syrup and let cook until it reaches 240F. This will only take 2-3 minutes, so keep an eye on it. Whip the whites on high speed until they reach medium peaks. Try and time it so that the whites and syrup are ready at the same time. If not, err on the side of the syrup. Better whites underwhipped by a bit than syrup that is too hot. Turn the mixer down to medium speed, and drizzle the syrup down the inside of the mixer bowl. Drizzle approximately 1/4 cup in slowly to heat the whites, and then stream the rest in. Turn the mixer back up to high and whip for a good 7 minutes or so, until it is cool. Add a bit more food coloring if you want a more pronounced color. Totally up to you. You will end up with a dense yet poofy cream that is super shiny and glossy and sticks up in straight, punk rock peaks. Use a spatula to scoop all the marshmallow cream out into a large piping bag fitted with a round tip (any size, depending on how thick you want your mallow swirls to be) or into a gallon-sized zip-top bag. Try not to make a huge mess, but this is pretty messy. Store in the fridge until you're ready to use. Churn the ice cream base according to manufacturer's instructions. About 20 minutes into churning time, get your ice cream container ready. If using a zip-top bag, snip off just a bit of the corner of the bag. Pipe the marshmallow cream into the bottom of the container. Use more or less, depending on your taste. Top with 1/3 of the crumbs. 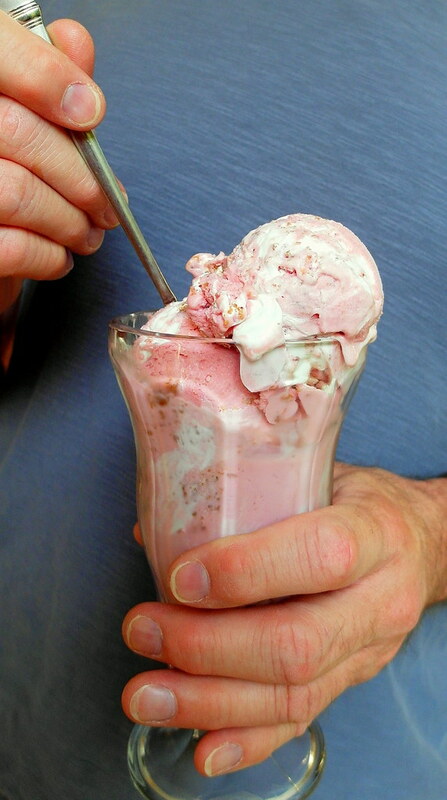 Once the ice cream is at a lovely soft-serve consistency, spoon 1/3 of it evenly over the mallow and crumbs. Pipe on more mallow cream and add another 1/3 of the crumbs. Add an additional third of the ice cream, spreading it evenly. Finish with more mallow cream, the rest of the crumbs and the rest of the ice cream. Press plastic wrap directly onto the surface of the ice cream and freeze for at least 8 hours. This ice cream is fairly soft, so make sure it is good and frozen before serving. 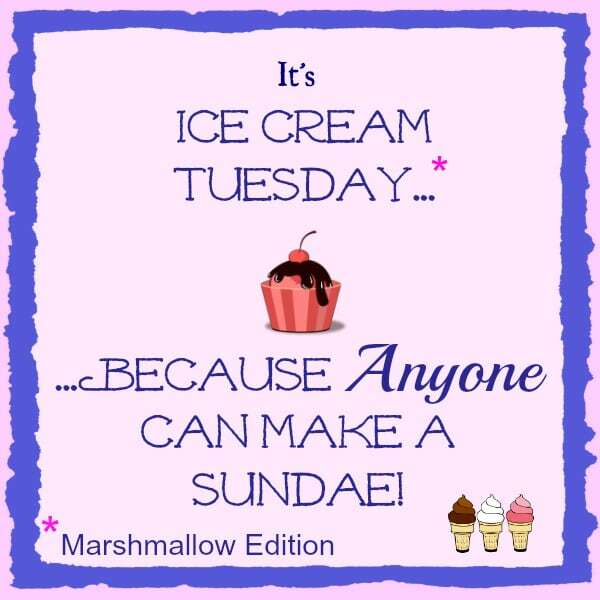 About our #MallowMadness #IceCreamTuesday. I am not much of a joiner, as a general rule. I don’t participate in any of the weekly or monthly baking and cooking challenges that go on in blogging land. And it’s certainly not because I don’t love my blogging community, because I really do. No, this goes way back to elementary school. I was never a fan of group projects. I didn’t like to have to rely on other folks for my grade. When I started Ice Cream Tuesdays just a few weeks ago, I figured it would just be me making ice cream and posting about it every Tuesday. And then when I started having so much fun with it, I thought it would be even more fun to invite some of my friends to play with me. I was so happy when a lot of them said Yes! We’ve been working on this sneakily for a couple of weeks now, sharing ideas through facebook and twitter messaging, and everyone seems to be really excited about this and have gone All Out with their ice creams! You’ll find them all below. Not all will necessarily be live at the same time (did I mention I hate rules?) but I will be sure to let you know when they are. And you can certainly check back, too. If you happen to be on twitter, you can follow along by searching the hashtags #icecreamTuesday, #marshmallowicecream and/or #mallowmadness. 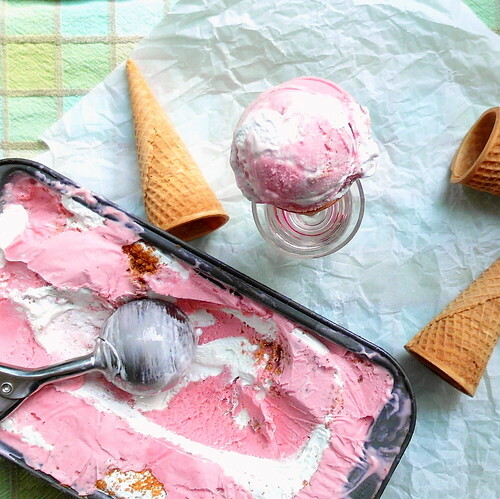 We also have an Ice Cream Tuesday Pinterest board where our Intrepid Band of ice cream friends are pinning the offerings from today’s shenanigans as well as other delicious-sounding ice cream treats, so do check that out too. I always knew my friends were talented, but would you just look at these flavors?! They have outdone themselves! You may know some of these wonderful ladies, and if you do hooray. If you don’t know everyone, please stop by their places for a visit. You can thank me later, but for now go enjoy all the Mallow Madness! And look–here they are again. Just click on the link below to see them all, complete with lovely photographs! Thanks for the inlinkz, Karyn! Thank you again to all my friends who played along with Ice Cream Tuesday, Mallow Madness edition. And thank you for spending some time here today. 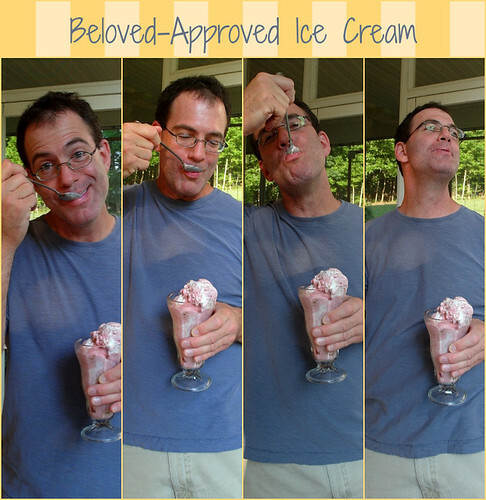 Stay tuned for more Ice Creams on Tuesdays as well as reimagined retro goodies on Throwback Thursdays and how-tos, ingredient spotlights and techniques on Fundamental Fridays. Jenni, this is one spectacular ice cream. Every component alone is a winner, then mixing them all makes for a show stopper!!! Thanks for organizing us…what a fun group! Whoa. Just…whoa. I’m not a cheesecake gal; it’s never on my list of Desserts I Need to Eat. But this. Well. I think I need some. Especially because summer is already here in Arizona (which doesn’t like to adhere to seasonal rules, now that you mention it), and it’s going to be 106 today. Thanks for putting this all together, Jenni – it was fun, and the recipes are amazing! 106?! Lunacy!! And if you don’t like cheesecake, cheesecake ice cream is the way to go, definitely! I’m so glad that you and some of the other lovelies from OKMH as well as even *more* buddies played along this week! You are always welcome to play! Love the flavors in this ice cream so much! Thanks, Matt! I am so happy with the way this came together, and the crunch from the cracker crumbs sets the whole thing off really nicely! WOAHHHH WOAHHHHH WOAHHHHHHHH OMG **blown away** the photos, the intricate recipe, masterfully created! You are the real deal Jenni! Thanks sooo much for inviting me and for being the BEST most awesome organizer. Sometimes I think I shoot myself in the foot by being so intricate, but then again “anyone can make a Sundae!” lol Thank you, Sophia, and I’m so happy you joined in! Oh my freaking goodness, you just made me crave for ice cream. And not just any ordinary ice cream. 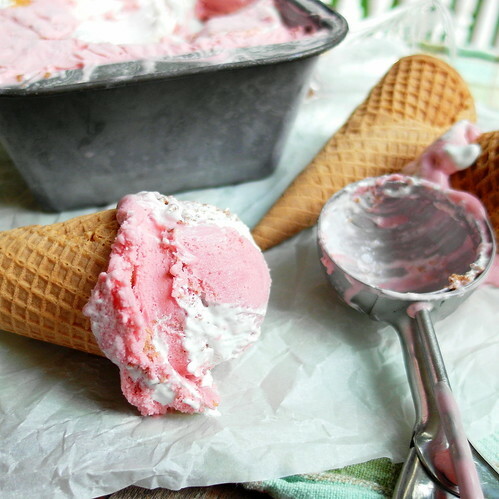 I want a big scoop of this homemade strawberry cheesecake marshmallow ice cream! Thanks for sharing the recipe and step by step process, Jenni! 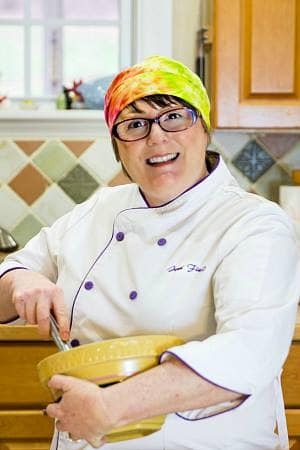 You are one amazing chef extraordinaire, my friend! Aw, BA! Thank you so much! You know I’d share scoops and scoops with you! And know you are welcome to play in Ice Cream Tuesday whenever you want. Just let me know and we can link up! I’m just glad I had wonderful folks to play along, Betsy! I have no idea what your party people are talking about because at our house beer definitely goes with ice cream. I love your flavor combination, Jenni, and I am not at all surprised that this is The Beloved-approved. Thank you so much for organizing this wonderful celebration of Marshmallow Madness! Thank you so much for creating ice cream Tuesday and for letting us participate for Mallow Madness. Your flavors are always unique and tempting! I always want to run to my kitchen after “visiting” you. Thank you for making this beautiful ice cream to share with us! Hooray for #MallowMadness! Who knew that a little online banter would evolve into something so delicious? I love your no-real-rules approach to group posts. I’m with Jeanne–I hope to make all of the ice creams by summer’s end. Just give me a reason to eat more ice cream.